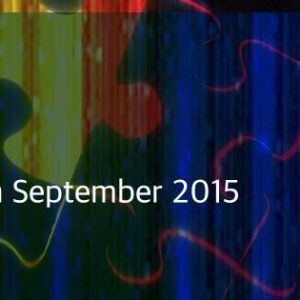 This September PUZZLE PROJECT reaches a very ripe 10 years of age! Originally launched to bring the best names to the intimate world of Brixton's Club 414. The biggest, small club night in the . 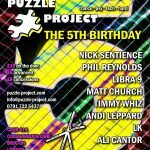 . .
**** WE ARE 6 **** London’s biggest small party celebrates its birthday and what a 6 years it’s been. In the intimate surrounds of Club 414 we’ve hosted some of the very biggest names in underground . . . 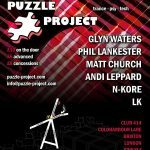 Thanks to all those who made it down to June’s edition of Puzzle Project – especially our guest DJs Glyn Waters and Nkore who really tore the 414 up good and proper!But that’s enough of the past. As . . .
First off a massive thanks to all those who made it down to May’s edition of Puzzle – one of the most up-for-it crowds we’ve had in recent times made sure we kicked off the first of our summer parties . 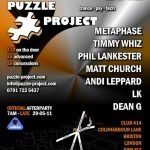 . .
Summer is well and truly here and with it the first of a series of scorching parties the team at Puzzle HQ have lined up for the next few months. This month we’ll be taking our customary journey . . . 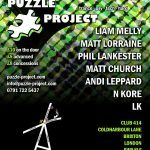 Puzzle Project Saturday 26th February 2011. 11pm-7am. 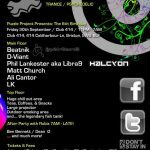 Psy - Trance - Tech Djs Phil Lankester, Matt Church, Andi Leppard, Elvis, N-Kore & LK. Ent £8b412 £12 after. Free! after party if already . . .
Another cracking party in October! Big thanks to our guest DJs – N-Kore turned in another jaw dropping set of euphoric psy, Matt Lorraine caused some serious dance floor damage in conjunction with our . . . So here we are – 5 years old and alive and kicking! 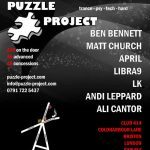 Thanks to all the Puzzle faithful who made it down to our birthday extravaganza – and what a party it was! Top notch sets from all our ressies – . 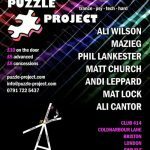 . .
WOW – August’s edition of Puzzle set new standards in musical mayhem, with top notch sets from all the Puzzle residents and some truly awesome guest DJs. Big thanks to Mazieg and Mat Lock who treated . 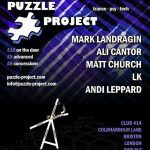 . .
July’s Puzzle set new standards for musical mayhem, with superb sets from our guest DJs Liquid Ross, Neil Psykinetic, and a wicked set from Kali – Glade’s loss was our gain, and we’re stoked she still . . .